We are extremely sorry to lose a very valued friend from ME846 family and that is Vera Wright (nee Belshaw). She died peacefully with her family around her on February 3 2013. Chris and Christine Cardose have been at every event and are indeed friends for life. Just as Vera's mother and brother Dennis was so generous in their hospitality to Peter Knox and "Porky" Bowering, Chris and Christine have been equally generous. 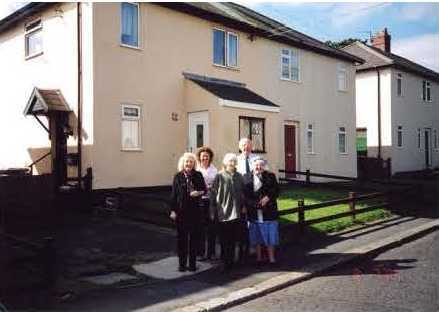 Pictured below in front of 4 Kingston Avenue, Bearpark - former Belshaw home where "Porky" Bowering and Peter Knox stayed on leave in 1943-1944; are from left to right: Jane Knox-Kiepura, Chris Cardose, Monica Knox, Vera and John Wright. We all send the family our deep condolences etc. and we look forward to being reminded of Vera's life during those WWII days. We are fast approaching the 70th Anniversary of the formation of 619 Squadron, which took place on 18th April 1943. "Weather - mainly cloudy good visibility. Fresh westerly wind around midday." In the January edition of the newsletter we asked whether people had any news that they wished to share with everyone. We have received some good feedback and here is the news from around the world. Thanks for the very interesting newsletter. It is here winter too. The last 14 days we have temperatures from -10 C until -15 C at night and -5 C by day. We visit the monument very often and there is always many people (walkers and bikers) so that every time we have to give them a lot of information that they ask us about the crew. "It has been announced today, 26 February 2013, by the Minister of State for Defence Personnel, Welfare and Veterans Mark Francois that all the details have been confirmed for the Arctic Star and the Bomber Command Clasp and the application process has now opened. This follows Sir John Holmes' independent medal review and the announcement by the Prime Minister, on 19 December 2012 that these awards should be made in recognition of the great bravery of those who contributed to two very significant campaigns of World War Two." "The criteria for the Bomber Command Clasp requires prior qualification for the 1939 to 1945 Star, to which it will be affixed, with the additional requirement to have flown at least one operational sortie with a Bomber Command operational unit. A clasp was deemed more appropriate, by Sir John, in the case of Bomber Command as aircrew had already received either the Aircrew Europe Star or the France and Germany Star and another medal would have constituted "double-medalling" for the same service." 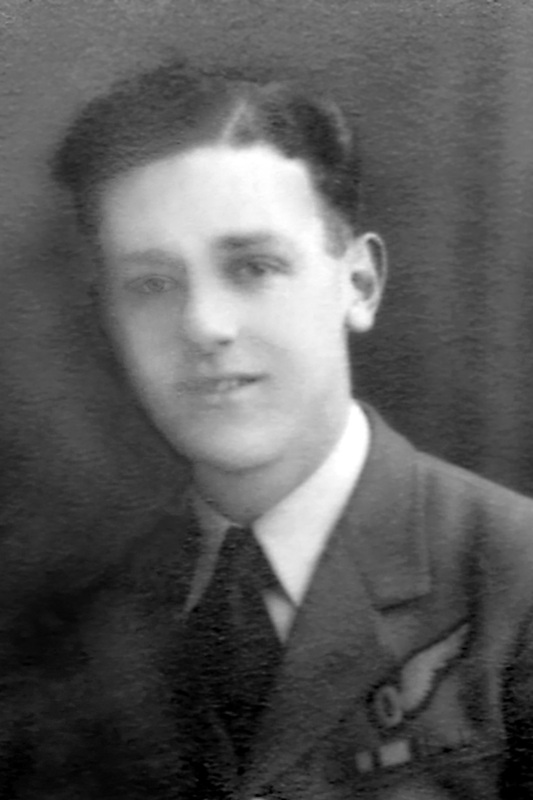 In 1992/3 I started to research, Alan Pickstone, the wireless operator of Lancaster LL919 from 619 Squadron as his cousin, a friend of mine, asked me what I could find out about him. All he knew was this he had been killed on 26/27 April 1944 and was buried at Landeville, France. Although I knew nothing about the RAF and Bomber Command, researching Alan Pickstone quickly became an obsession! I realised I could not research him and not the rest of the crew. Indeed, I did very well in obtaining photographs and finding details and family members of all the rest of the crew with the exception of the flight engineer, Ernest George Cass, who proved to be very elusive. The Commonwealth War Graves Commission stated his widow lived in Nottingham so that was where I focused by search - but nothing. Eventually, a former colleague of Cass came up with a record card from RAF Halton where he and Cass had trained. This gave an Isle of Wight address. But, apart from a mention on a war memorial in Freshwater, Isle of Wight, I was no further forward. I had visited the graves of the crew in Landeville three times and had come to know the locals and kept in touch. One day in 2010 I received a letter. The sender's name on the envelope was Cass... It was from Cass's daughter explaining that she had been to France to visit her father's grave. The locals had asked her if she knew me. She did not. They gave her my contact details and so she wrote to me. I was over the moon! We chatted on the phone and later she sent me a lovely photo of her father who she never knew as she was born after he was killed on 26/27 April 1944. Her mother remarried a few years later and had now had no contact with Nottingham or the Isle of Wight. Judith and I met in London last year for the first time and had a great time. I gave her a copy of the small book I had written about my research and told her that I also give a slide-talk about it. She has kindly allowed me to use the photo of her father in the next reprint of the book, in the slide-talk - and here in the newsletter. We plan to meet again in London and go to the new Bomber Command memorial. I am hoping she will join 619 Squadron Association and come to the reunions. 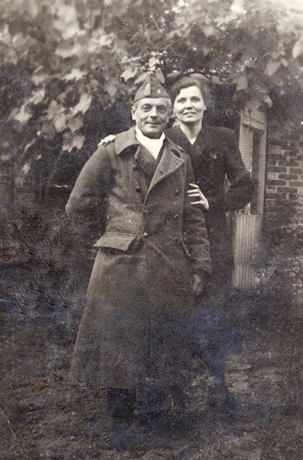 So, at last, after about seventeen years of knowing nothing about Cassie (as he was known in the RAF) I now have a lovely photo, lots of personal details from his family and a new friend in Judith. 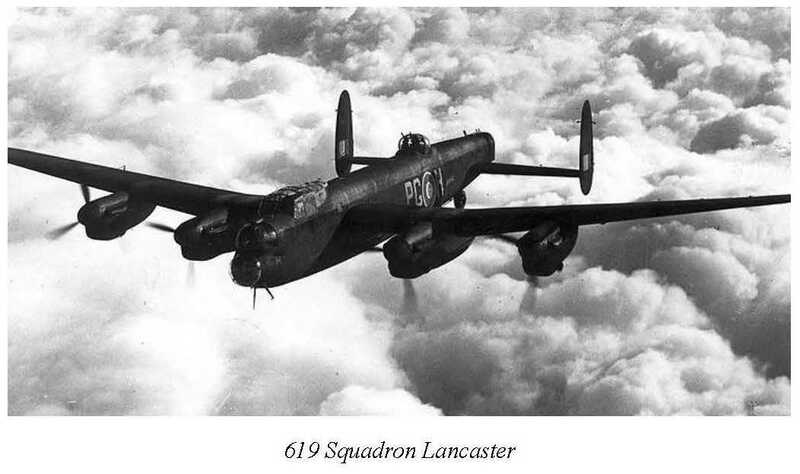 Those 'lads' of ill-fated Lancaster LL919 changed my life! I'm looking for any help in trying to find my father's service in the RAF during WWII on Avro Lancaster bombers. My father never talked about his time in the RAF on Lancasters & he never talked to my mother or me about his time with the RAF at all. All I know was that he was a rear gunner on Avro Lancaster bombers & he lost his wedding finger whilst in the RAF. We don't know what Sqn he served with or his service number which is making it very hard to trace him. He was Sergeant Arthur Hendley. 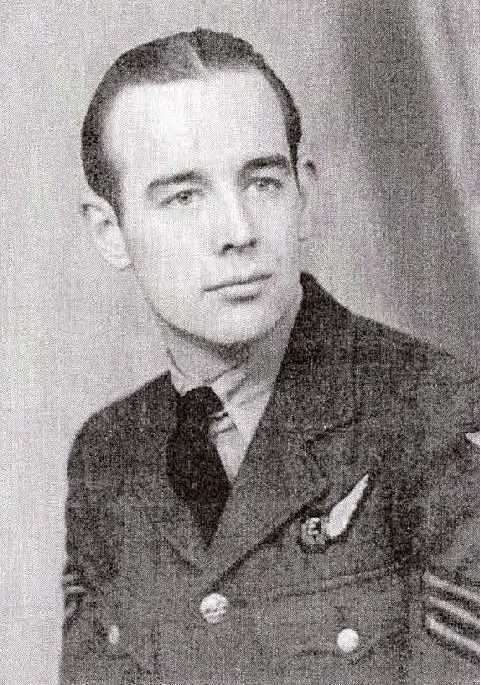 I'd be very grateful if you could leave a notice on your bulletin board in the hope someone recalls his name, I'm contacting every Lancaster Squadron Association in hope I can find who he served with. 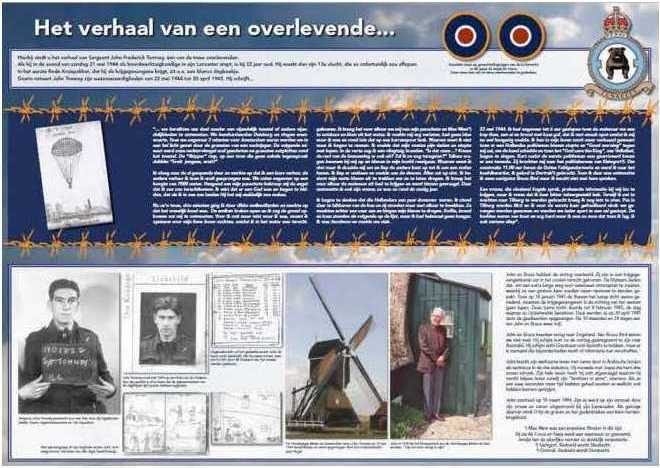 The other week Jane Knox was approached by Andries van der Graaf in the Netherlands who is preparing a commemorative display board in the memory of a crew of Avro Lancaster Bomber, ND956 AS-1, which crashed at 1:38 am in Goudriaan on Monday, 22nd May, 1944. Andries wrote: "In the village of Goudriaan, there are 5 graves of the crew of RAF Lancaster ND956, AS-I of 166 squadron that came back from Germany after bombing Duisburg. It was shot down by a Messerschmitt German fighter. This was on the night of 21-22 May 1944. The people and the Municipality of this village take good care of the graves and every May 4th we have a commemoration for our and allied fallen men and women. In this crash 2 men escaped death, were arrested and brought to Stalag Luft 7 near Bankau in Poland." 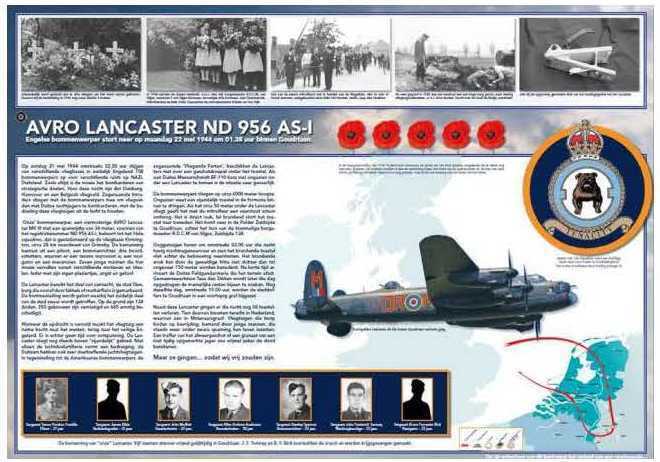 Over the recent weekend (6 to 7 April) we have been notified that one of the photos (Bruce Forrester Bird) for the Lancaster ND956 AS-1 has now been located. Any help with Flt Sgt James Kiltie would still be greatly appreciated. Jacky Moffatt (pictured above), a crew member killed in the ND956 incident is related to the Knox family through marriage. 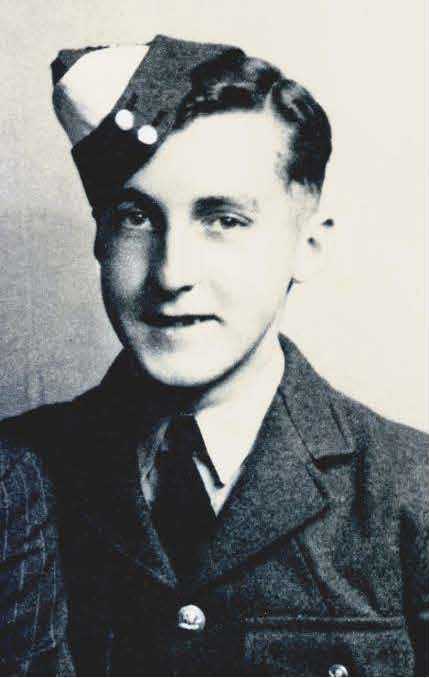 His brother Stephen Moffatt has attended many of the ME846 functions in Belgium and at Newark. The following pictures show what each side of the commemorative display board will look like when completed. We are working on producing an English version of the commemorative display board, so if anyone is interested we should be able to email out copies in due course. 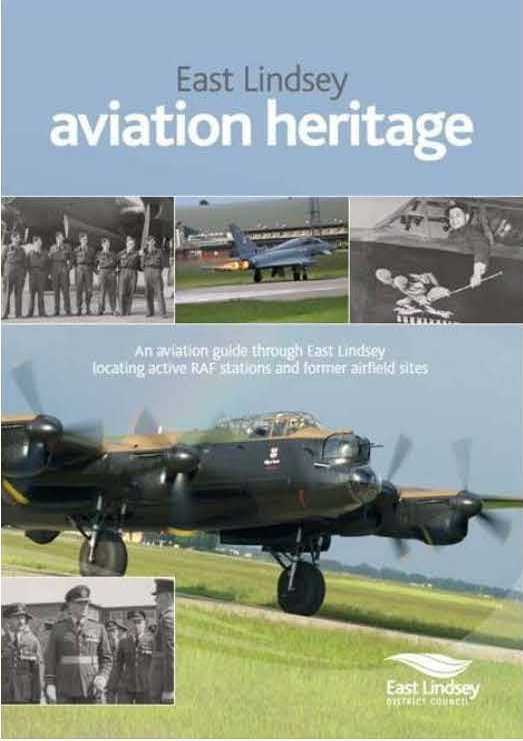 As mentioned in the last newsletter Howard Heeley has been preparing a new aviation heritage booklet for the East Lindsey District Council, which features several 619 Squadron airfields.